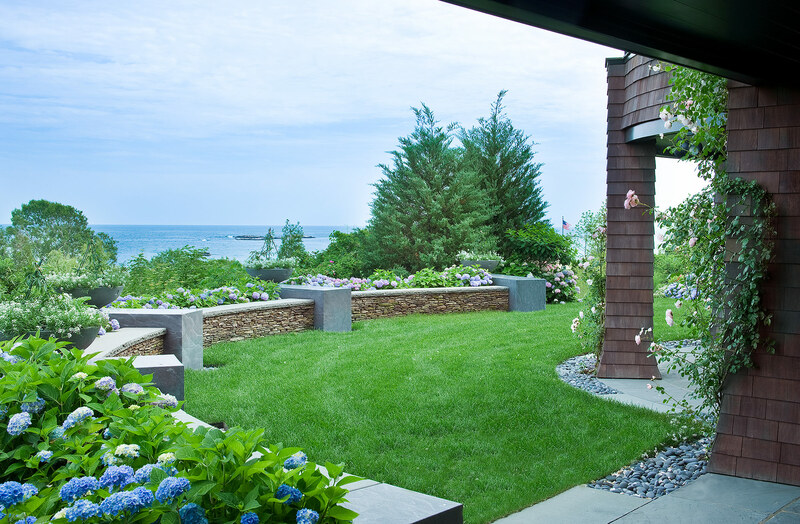 Hillside sits atop a steeply sloping acre of land overlooking the Atlantic Ocean. 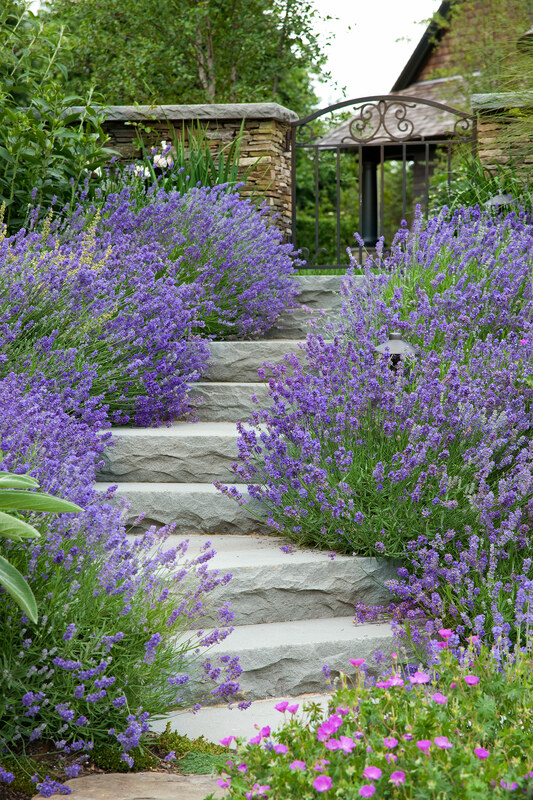 Its landscape flows down the hill with shades of grey and blue, like water to the sea. 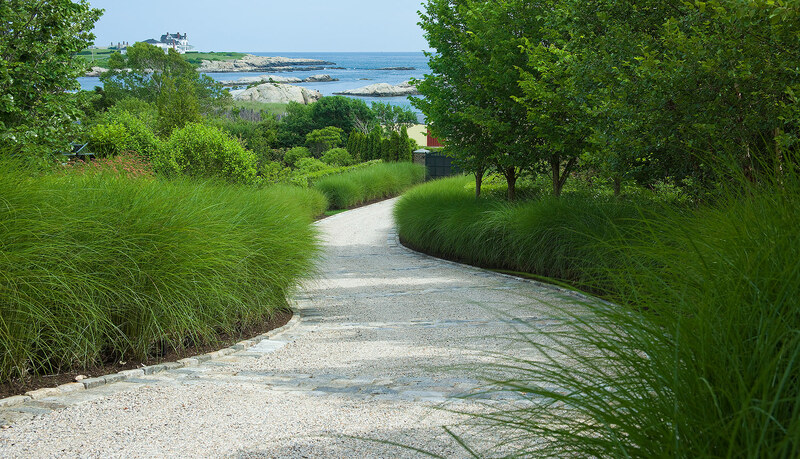 The curving driveway is lined with grasses, linking the house to the beach and marsh below. 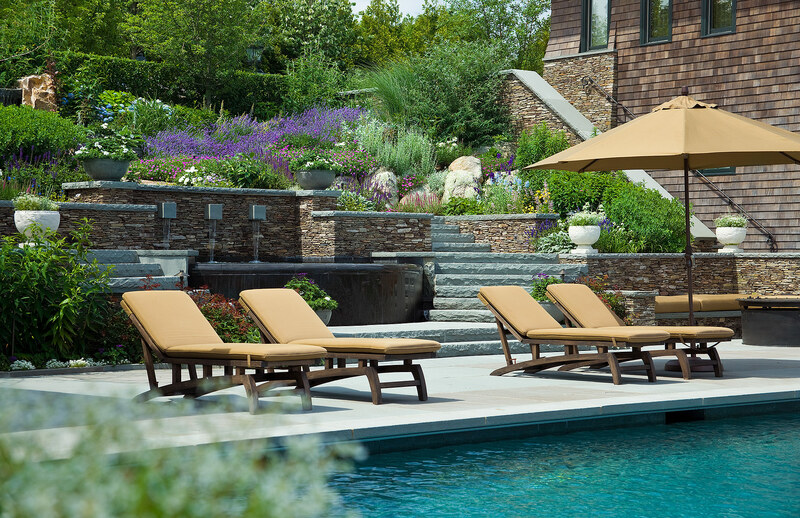 Our work spanned two owners and began with the new house and pool construction. 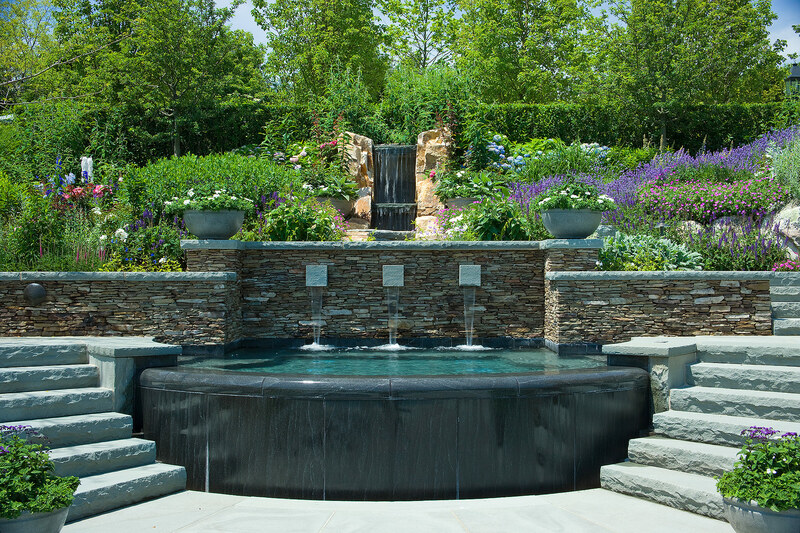 The more recent phase included a pool fountain wall, pool house schematics, outdoor kitchen, spa, fountains, railings, handrails, fences, garden and driveway gates, lighting, motorcourt paving, gardens, pathways, screen planting, retaining walls, steps, an outdoor shower, pots and perennial gardens. 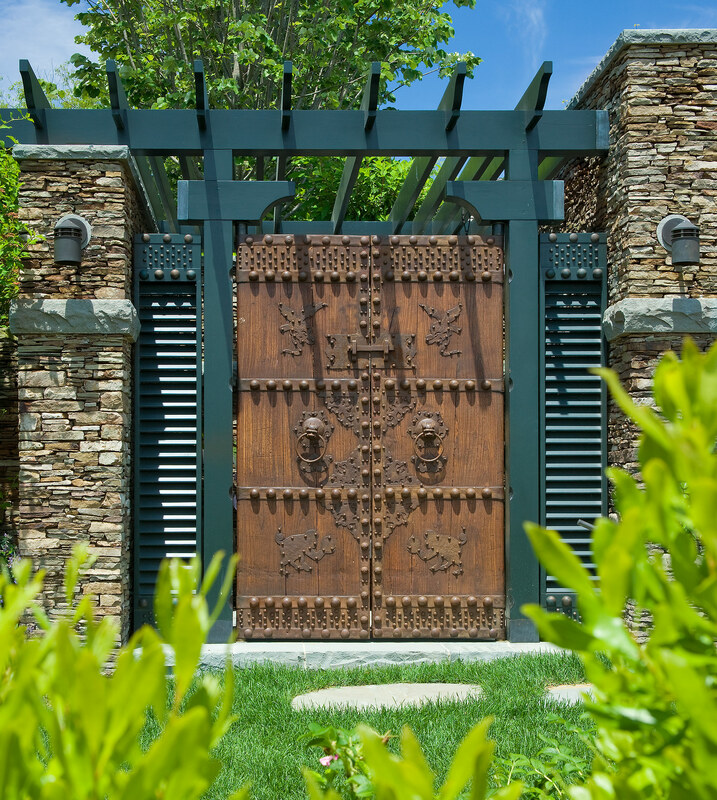 The design creates a private summer resort for a family inspired by Asian art and culture. 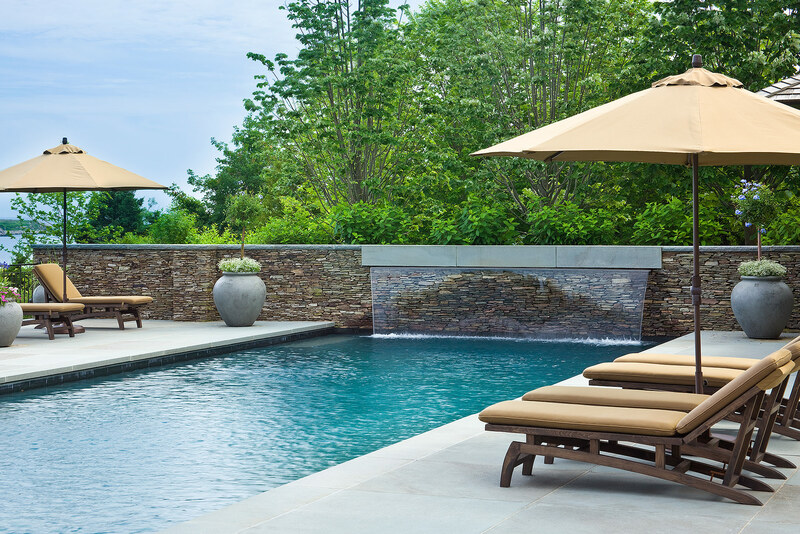 The steep site lends itself to terraces that evoke Asian agricultural practices. 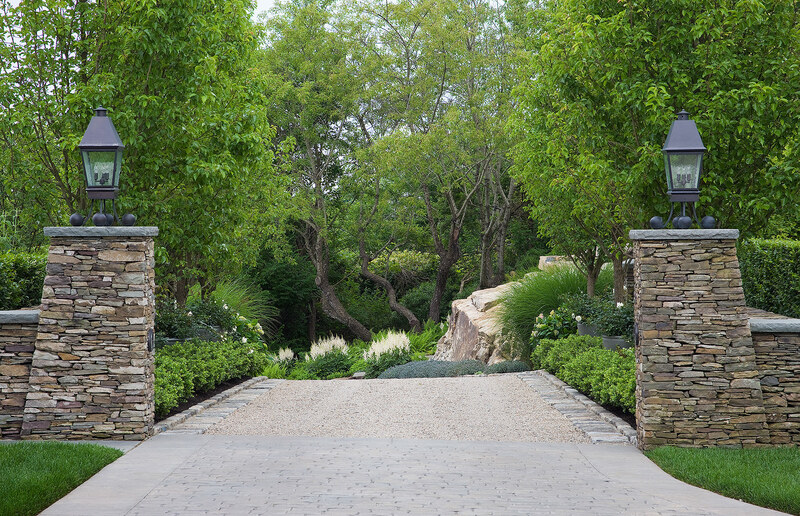 Architectural stone blocks are incorporated into the terraced landscape highlighting the geometry of the site. 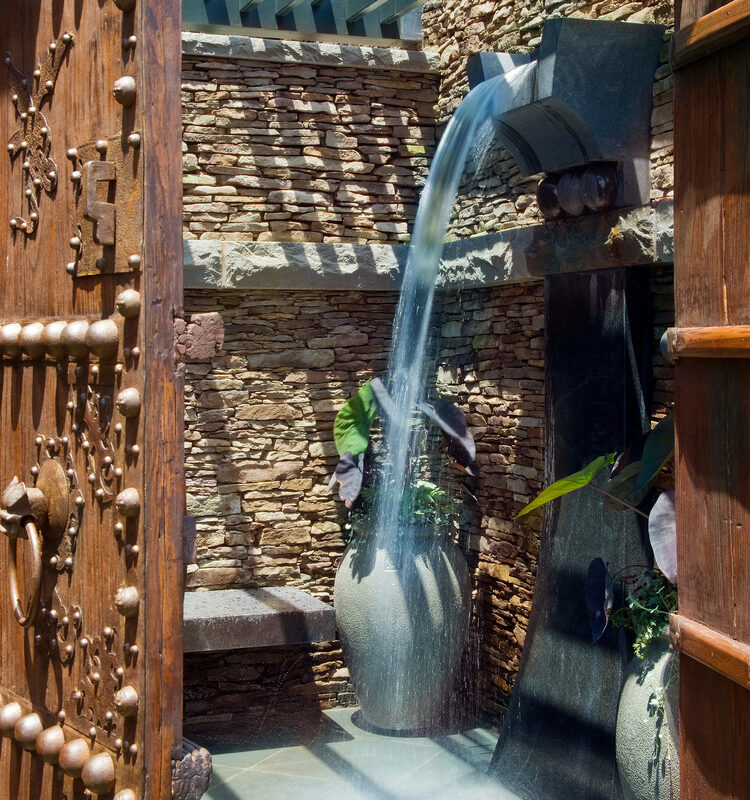 Chinese doors and a collection of ancient bronze bells embellish the outdoor shower room. 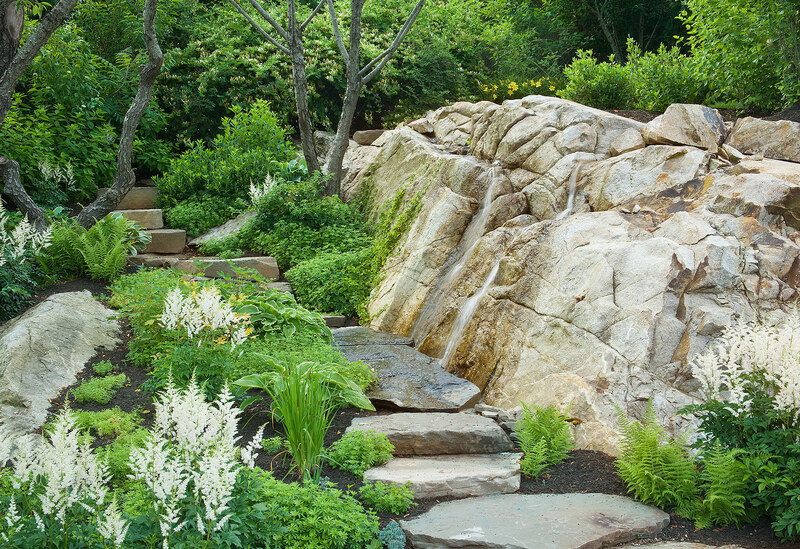 A custom designed granite shower wall provides an experience akin to standing under a waterfall. Water elements are found throughout the property. 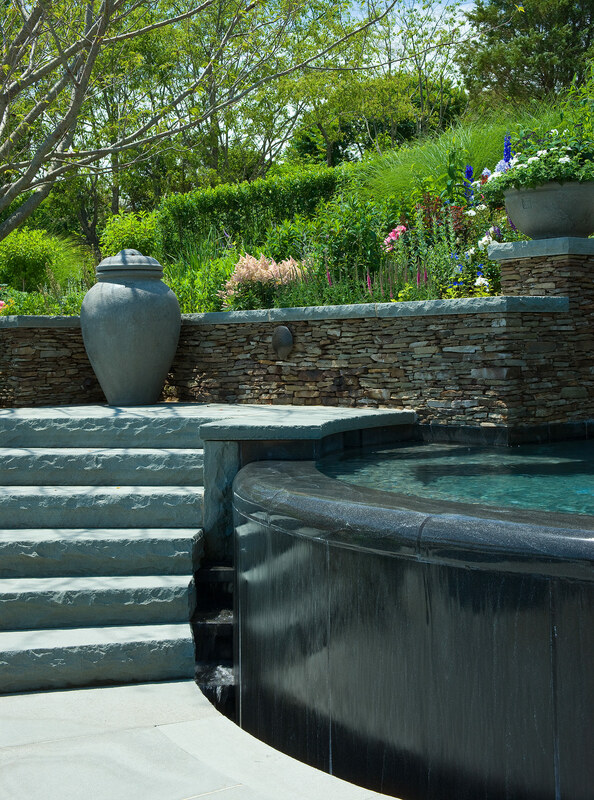 The natural rock ledges and boulders create multiple opportunities for recirculating water features, some of which appear to flow through the spa. 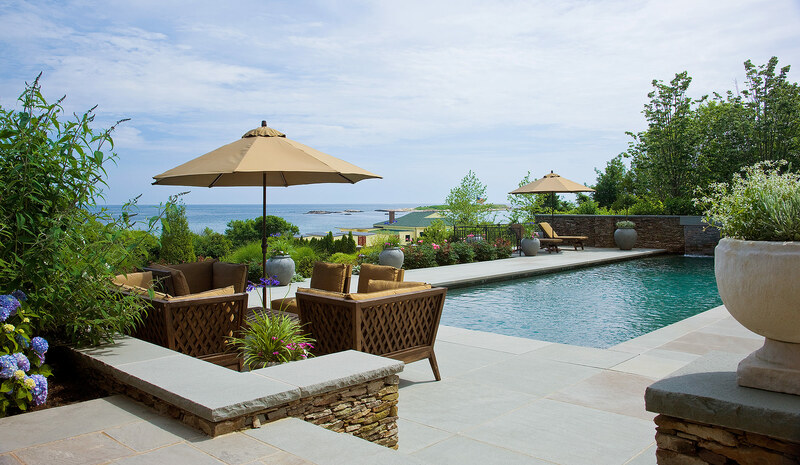 The pool and its waterfall mimic the powerful sounds of the waves crashing against the rocky shore below. 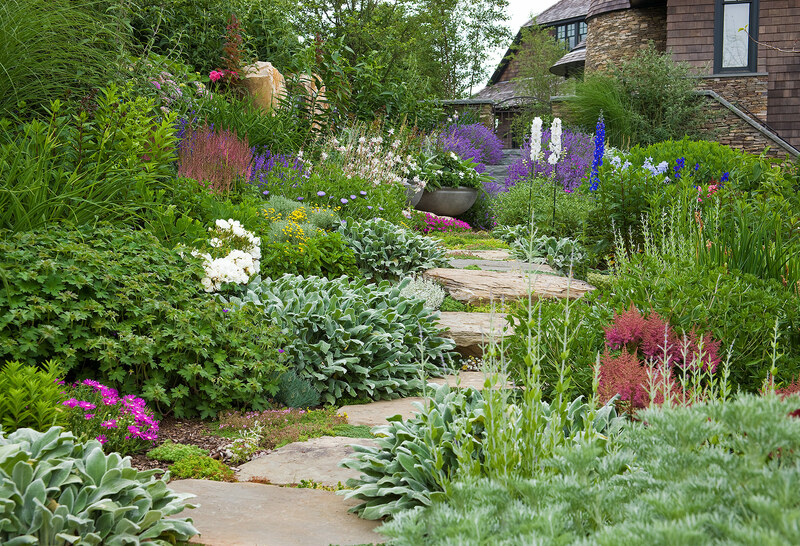 The design creates a naturalistic but diverse landscape by tying together native and domesticated plant communities. 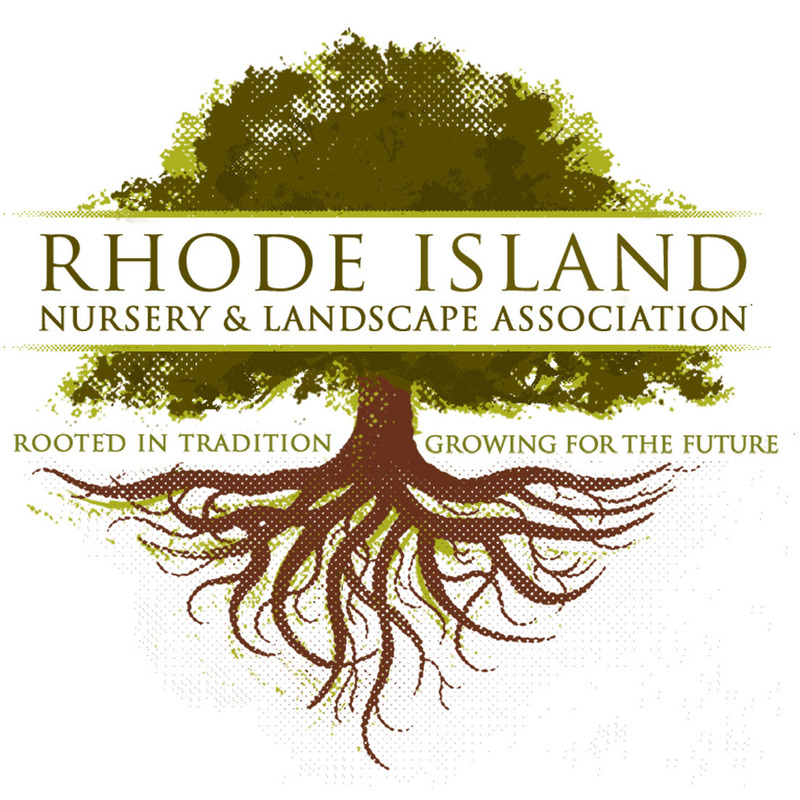 On the sunny hillside, the use of roses and spruces provide screening for the adjacent areas and privacy from neighbors.